Is your heat pump not working the way that it used to? Global Heating & Cooling can help you asses the problem and implement a solution. For a limited time, we are offering a free trip charge with any repair exceeding $150. We service and repair all kinds of heat pumps including air-to-air, geothermal, and water models. Don't let the comfort of your family be compromised when our team can swoop in and fix the problem! Your Heat Pump is Not Defrosting - This represents one of the most common heat pump issues. If you notice that your heat pump is covered with a thick layer of snow and ice, it could indicate that the transfer of heat is being effected. If it continues to run in this capacity, it could lead to system failure or damage to various components of the heat pump. Under normal circumstances, a unit should periodically switch to an "air-conditioning" mode to help defrost the accumulated ice in the winter. If your heat pump is not doing this, then there is a problem and it could be due to a number of factors. 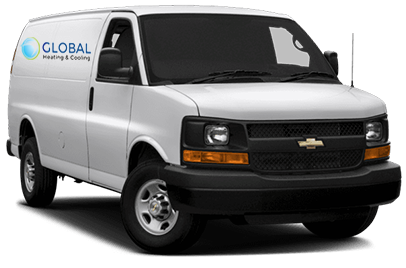 Call Global Heating & Cooling. Continuous Operation - Your unit should not be running constantly. It should cycle between being on and off. The only exception is during a very cold spell or a heat wave when constant operation is needed to reach a comfortable temperature. If the weather is not extreme, and your unit is running constantly, it could indicate that your unit is not appropriately sized for your space, that there is a leak or that there is a problem with the compressor. Not Blowing Right Temperature - If you find that your unit is blowing cold air when it "heating" mode, or warm air when in "A/C mode" then a valve or compressor problem may be to blame.